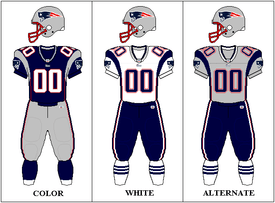 The 2005 New England Patriots season was the 36th season for the team in the National Football League and 46th season overall. They finished with a 10–6 record and the division title before losing in the playoffs to the Denver Broncos. Ten days after earning a victory in Super Bowl XXXIX, linebacker Tedy Bruschi suffered a stroke and initially planned on missing the entire season; Bruschi returned to the field against the Buffalo Bills on October 30. Cornerback Ty Law was released in the offseason, and injuries at cornerback, as well as a season-ending injury to safety Rodney Harrison in Week 3, forced the Patriots to start a number of players in the secondary early in the season. Overall, injuries caused the Patriots to start 45 different players at one point or another during the season, an NFL record for a division champion (breaking the record of 42 set by the Patriots in 2003). With the fourth seed in the AFC playoffs, the Patriots defeated the Jacksonville Jaguars in the Wild Card Playoffs but fell to the Denver Broncos on the road in the Divisional Playoffs, committing five turnovers in the game. Free agents or potential free agents Brandon Gorin, Patrick Pass, Stephen Neal, Tom Ashworth, Don Davis, David Givens, Jarvis Green, and Troy Brown (after being released) were all re-signed, while Tom Brady, Mike Vrabel, and Green all received long-term contract extensions. Defensive lineman Richard Seymour held out for the first four days of training camp but returned after receiving a raise. Kicker Adam Vinatieri signed and played the full season under his franchise tag tender. As of the Patriots' first training camp practice at Gillette Stadium on July 29, they had 79 players signed to their roster, one short of the NFL maximum of 80 players. Richard Seymour did not count against the limit as he held out of the start of training camp and was placed on the Reserve/Did Not Report list. Michael McGrew also did not count against the limit after being waived/injured the day before training camp began. Finally, the Patriots received seven total roster exemptions for the NFL Europe allocations of Ricky Bryant, Kory Chapman, Joel Jacobs, Cedric James, and Grant Steen (one for each player, plus two bonus exemptions because of the time Chapman and James spent on practice squads in 2004). Coming off their second straight Super Bowl win, the Patriots and Gillette Stadium played host to the extravagant NFL kickoff celebration and the Oakland Raiders. The reality of the new season would hit the Patriots hard on the game's first drive, with a long catch by Randy Moss setting up a 2-yard touchdown catch from Kerry Collins to tight end Courtney Anderson. The Patriots would respond with an Adam Vinatieri field goal, and then take the lead on an 18-yard touchdown reception by reigning Super Bowl MVP Deion Branch. In the second quarter, Moss tore through the Patriots' secondary again, this time taking a 73-yard catch the distance for a touchdown. The Patriots would re-take the lead on the next drive when Brady hit Tim Dwight on a 5-yard scoring strike. After a Jarvis Green strip-sack of Collins was recovered by Vince Wilfork deep in Raiders' territory, the Patriots expanded their lead on an 8-yard Corey Dillon touchdown run. In the fourth quarter, Dillon ran for a 2-yard touchdown that gave the Patriots a 30–14 lead. Following a blocked Josh Miller punt, the Raiders had the ball in Patriots territory and capitalized, with Collins completing a 5-yard touchdown pass to Anderson. The Patriots then ran out the clock to secure a 30–20 opening victory. 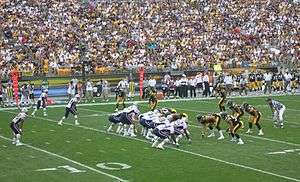 In a much-anticipated re-match of the previous season's AFC Championship, the Patriots traveled to Heinz Field to face the Steelers. After the Patriots took an early lead on a 4-yard Corey Dillon touchdown run, the Steelers responded when Ben Roethlisberger connected with Hines Ward on an 85-yard touchdown catch the very next play. The Steelers took a lead on a Jeff Reed field goal and then recovered a Kevin Faulk fumble deep in Steelers' territory. Roethlisberger would then hit Antwaan Randle El on a 49-yard play, but Randle El would unsuccessfully attempt a lateral to Ward at the Patriots' 11-yard line, which was recovered by the Patriots. Brady would make a second foray into the Steelers' red zone late in the first half, but the Patriots would again come up short when Brady's pass was tipped and intercepted by the Steelers. The struggles would continue for the Patriots in the third quarter, which Vinatieri missing a field goal before Faulk fumbled for the second time in the game, recovered by the Steelers, who then took a 13–7 lead on a field goal. The game then turned in the Patriots' favor, with Vinatieri hitting a field goal before Brady mounted an 86-yard scoring drive that ended in Dillon's second touchdown of the day, giving the Patriots the lead. Another Vinatieri field goal proved important, as the Steelers tied the game on a 4-yard Roethlisberger-to-Ward strike with just over a minute remaining. With seconds remaining, the Patriots drove into Steelers territory and Vinatieri's 43-yard field goal attempt was good, sealing a 23–20 Patriots victory. The win would prove costly for the Patriots, though, who lost starting tackle Matt Light and safety Rodney Harrison to season-ending injuries. The undefeated Colts and quarterback Peyton Manning traveled to Foxboro looking for their first win there since 1995. In the spotlight of Monday Night Football, the Patriots defense proved not able to control the Colts offense as they had done in a 20–3 showing in the last matchup between the two teams; Manning and Marvin Harrison connected on a 48-yard catch on the game's second play, which was followed by a 1-yard touchdown grab by Harrison. Tom Brady and the Patriots responded by mounting a long drive that ended in a 16-yard touchdown catch by Deion Branch. The Patriots defense though, proved ineffective at stopping the Colts on third down, giving up a 17-play drive that ended in a 2-yard touchdown run by Edgerrin James. On their next drive, a Mike Vrabel interception of Manning gave the Patriots good field position, only to be squandered by a Corey Dillon fumble at the Colts' 18-yard line. To close the first half, Manning led the Colts on another scoring drive, connecting with Reggie Wayne on a 10-yard touchdown pass. The Colts' offense continued to dominate in the second half, taking a 28–7 lead after Dominic Rhodes ended an 11-play drive with a 4-yard touchdown run. Brady responded with a 31-yard touchdown pass to Daniel Graham, but the Colts' offense kept scoring, adding two Mike Vanderjagt field goals into the fourth quarter; the first came after the Patriots unsuccessfully tried to catch the Colts off-guard with an on-side kick. Down 20 points, Brady mounted another scoring drive, this time hitting Troy Brown on a 19-yard touchdown strike to cut the Colts' lead to 34–21. The Colts would come right back to crush the Patriots' hopes of a comeback, with Manning hitting Harrison on a 30-yard touchdown pass. Veteran Doug Flutie replaced Brady in the game's final minutes as the Colts came out of Foxboro with a decisive 40–21 victory. Brady was held without a touchdown pass for the third time in the previous two seasons and Adam Vinatieri surpassed Gino Cappelletti as the Patriots' all-time leader in points. Vinatieri would finish his Patriots career with 1,158 and remained the franchise's all-time points leader until his successor, Stephen Gostkowski, surpassed him in Week 15 of the Patriots 2014 championship season. The three-time Super Bowl champion Patriots, who for the first time in their previous three playoff trips would have to win three games to advance to the Super Bowl, defeated the Jaguars 28–3. Linebacker Willie McGinest set NFL playoff records for sacks in a game (4.5, 1 sack ahead of the old record held by Richard Dent and Rich Milot) and career postseason sacks (16, two ahead of the old record held by Bruce Smith), while quarterback Tom Brady threw for 201 yards and three touchdown passes. In the first half, the Jaguars recorded four sacks and held New England to 126 yards, while the Patriots defense recorded two sacks, gave up only 115 yards, and didn't allow a first down until 9:40 remained in the second period. Neither team could score in the first quarter, but early in the second, New England receiver Tim Dwight returned Chris Hanson's 46-yard punt 27 yards to the Jaguars 37-yard line. Two 4-yard runs by Corey Dillon and an 18-yard burst from Kevin Faulk then moved the ball to the 11-yard line, and Brady capped off the drive with an 11-yard touchdown pass to Troy Brown. On Jacksonville's ensuing possession, Jimmy Smith's 19-yard reception his team a first down for the first time in the game and moved the ball to the Patriots 44-yard line. But on the next play, a tackle from safety Eugene Wilson caused Alvin Pearman to fumble the ball, and defensive lineman Richard Seymour recovered it. However, the Patriots could not take advantage of the turnover; Jacksonville managed to force a punt and then drove into scoring range for the first time in the game. Quarterback Byron Leftwich completed five passes for 59 yards on the drive, and Josh Scobee finished it with a 36-yard field goal, cutting their deficit to 7–3. After the kickoff, Faulk's 21-yard reception moved the ball to midfield and gave the Patriots a chance to increase their lead before halftime, but receiver Deion Branch dropped a pass from Brady at the Jaguars 10-yard line with 19 seconds left. With New England leading 3–0 with less than two minutes left in the first half, Broncos linebacker Ian Gold recovered a fumble from Kevin Faulk on the Patriots 40-yard line. After that, a pass interference penalty on Samuel moved the ball to the 1-yard line, and then Mike Anderson scored a 1-yard touchdown run on the next play. On the ensuing kickoff, Ellis Hobbs fumbled that and kicker Todd Sauerbrun recovered the ball on the Patriots 39-yard line, setting up kicker Jason Elam's 50-yard field goal to give Denver a 10–3 halftime lead. Early in the third quarter, the Patriots drove 58 yards in 11 plays and scored with a 32-yard field goal from Vinatieri, cutting their deficit to 10–6. With less than a minute to go in the third quarter, New England reached the Denver 5-yard line. However, Brady was intercepted for the first time in the playoffs since Super Bowl XXXVIII. The interception was returned by Champ Bailey for 101 yards before New England tight end Benjamin Watson knocked the ball out of bounds at the New England 1-yard line. The Patriots challenged whether the ball was actually knocked through and out of the end zone (which would have been a touchback and given the Patriots the ball at their own 20-yard line), but the original call stood. Mike Anderson then ran for another one-yard touchdown on the next play to increase Denver's lead, 17–6. Then on New England's next drive, the usually accurate Vinatieri missed a 42-yard field goal, his first in 21 field goal attempts in the playoffs. Later in the fourth quarter, Troy Brown muffed a Denver punt and the Broncos recovered it on New England's 15-yard line, setting up Rod Smith's four-yard touchdown pass from Plummer. With 8:33 left in the game, Brady completed a 73-yard pass to Deion Branch and then followed it up with a 4-yard touchdown pass to David Givens, cutting the score to 24–13. But on the Broncos ensuing possession, Plummer's 42-yard completion to Smith set up another Elam field goal. Denver then all but clinched the game when safety John Lynch intercepted a Brady pass with less than 3 minutes remaining. Brady finished the game completing 20 out of 36 passes for 341 yards, one touchdown, and two interceptions, but lost his first NFL postseason game. Also, Patriots head coach Bill Belichick lost his first postseason game since taking over the team in 2000, as both the coach and his quarterback had compiled 10 straight playoff wins before this (the trio of 3–0 runs to Super Bowl titles and the previous win over Jacksonville). Branch caught 8 passes for 153 yards, while Rod Smith caught 6 passes for 96 yards and a touchdown. This would become the Patriots' first postseason loss since 1998 when the team lost to the Jaguars in the Wild Card Round. With his 10-point performance in the Patriots' Week 13 win over the New York Jets, kicker Adam Vinatieri became the Patriots' all-time leading scorer, breaking Gino Cappelletti's mark of 1,130 points. ↑ Bill Belichick Biography New England Patriots. Retrieved April 23, 2007. ↑ Patriots' Bruschi Suffers Stroke About.com. Retrieved June 10, 2007. ↑ Tedy Bruschi and stroke Kevin, M.D. – Medical Weblog. Retrieved June 10, 2007. ↑ Bruschi to sit out 2005 Archived September 29, 2007, at the Wayback Machine. Patriots.com. Retrieved June 10, 2007. ↑ Ready Bruschi Boston.com. Retrieved June 10, 2007. ↑ Weis to be introduced as Irish coach Monday ESPN.com. Retrieved November 8, 2007. ↑ Browns hire Crennel as head coach CBC Sports. Retrieved November 8, 2007. 1 2 3 4 5 New England Patriots February 9–27, 2005 Transactions Pro Football Weekly. Retrieved November 8, 2007. 1 2 3 4 5 6 7 8 9 New England Patriots March, 2005 Transactions Pro Football Weekly. Retrieved November 8, 2007. ↑ "Cory Undlin biography". ClevelandBrowns.com. Archived from the original on October 31, 2007. Retrieved July 6, 2008. ↑ "Patriots Exec to join Harvard Business School faculty". Patriots.com. February 11, 2005. Archived from the original on August 24, 2005. Retrieved May 31, 2008. ↑ "Lionel Vital biography". AtlantaFalcons.com. Archived from the original on May 10, 2008. Retrieved July 6, 2008. ↑ "Keith Kidd story archive". ESPN. Archived from the original on July 14, 2008. Retrieved July 6, 2008. ↑ New York Jets August 8–21, 2005 Transactions Pro Football Weekly. Retrieved November 8, 2007. ↑ Phifer sent packing by Patriots CBC Sports. Retrieved November 8, 2007. ↑ New England Patriots May, 2005 Transactions Pro Football Weekly. Retrieved November 8, 2007. ↑ New England Patriots July 25 – August 8, 2005 Transactions Pro Football Weekly. Retrieved November 8, 2007. ↑ Chad Brown Biography New England Patriots. Retrieved November 8, 2007. ↑ Monty Beisel Biography New England Patriots. Retrieved November 8, 2007. ↑ Doug Flutie Biography. Retrieved November 8, 2007. ↑ Artrell Hawkins Biography New England Patriots. Retrieved November 8, 2007. ↑ Chad Scott Biography New England Patriots. Retrieved November 8, 2007. ↑ Wesly Mallard Biography New England Patriots. Retrieved November 8, 2007. ↑ Tim Dwight Biography New England Patriots. Retrieved November 8, 2007. ↑ Antuan Edwards Biography New England Patriots. Retrieved November 8, 2007. ↑ New England Patriots June 27 – July 24, 2005 Transactions Pro Football Weekly. Retrieved November 8, 2007. Archived May 12, 2006, at the Wayback Machine. 1 2 3 4 New England Patriots April, 2005 Transactions Pro Football Weekly. Retrieved November 8, 2007. ↑ Troy Brown Biography New England Patriots. Retrieved November 8, 2007. ↑ Brady finally agrees to long-awaited contract extension ESPN.com. Retrieved November 8, 2007. ↑ With a 40 percent raise, Seymour comes to camp The Boston Globe. Retrieved November 8, 2007. ↑ Duane Starks Biography New England Patriots. Retrieved November 8, 2007. ↑ Andre' Davis Biography New England Patriots. Retrieved November 8, 2007. ↑ The Patriots traded their second-round pick in 2005 to the Baltimore Ravens for Baltimore's third- and sixth-round picks in 2005 and their third-round pick in the 2006 NFL Draft. Patriots.com summary Archived October 10, 2007, at the Wayback Machine. ↑ Draft pick received with a 2006 fifth-round pick in a trade from the Oakland Raiders for the Patriots' 2005 sixth-round pick (received in a trade from the Green Bay Packers for the Patriots' 2005 sixth-round pick (received with a 2005 third-round pick and 2006 third-round pick in a trade from the Baltimore Ravens for the Patriots' second-round pick) and 2005 seventh-round pick). Archived October 10, 2007, at the Wayback Machine. 1 2 Brady honored Boston.com Reiss' Pieces. Retrieved November 8, 2007. ↑ 2005 Sportsman of the Year SI.com. Retrieved December 21, 2007. ↑ Injury report Boston.com Reiss' Pieces. Retrieved November 8, 2007. 1 2 Honors for two Boston.com Reiss' Pieces. Retrieved November 8, 2007. ↑ Pats wrap Boston.com Reiss' Pieces. Retrieved November 8, 2007. ↑ Late night Pats notes Boston.com Reiss' Pieces. Retrieved November 8, 2007. ↑ McGinest: 12th man Boston.com Reiss' Pieces. Retrieved November 8, 2007. ↑ Reiss, Mike (January 27, 2006). "Seymour out too". Boston.com Reiss' Pieces. Retrieved June 16, 2008. ↑ Adam's feat Boston.com Reiss' Pieces. Retrieved November 8, 2007.